*Set Includes:1/4, 1/3, 1/2, 2/3, 3/4, and 1 cup sizes. * 1/8, 1/4, 1/2, 1 tsp. and 1/2 tsp., 1 tbsp spoon sizes. 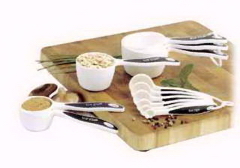 *Grip handles allow for a no slip hold on the utensil. *Designed for a right or left hand use. Silicone Jar/Icing Spatula-Red Beautifully ice your cakes, cupcakes, and more with this quality icing spatula. 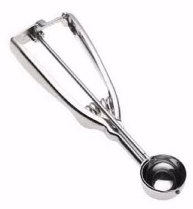 Also ideal for removing baked goods from dishes without breaking or crumbling. Made of durable, heat resistant silicone, this spatula won't warp, stain, or retain odors. Flexible and thin, it is perfect for reaching into deep jars and scraping the edges of bowls. Features a soft, comfortable handle for easy gripping. Measures 10.5in/26.5cm. Hand washing recommended. Easy to clean and very durable! Bakes evenly and avoids burning! Easy release of foods easy to clean and dishwasher safe! Good for cookie dough, melon balls, ice cream, frozen yogurt, meat balls, and mash. Get the perfect amount of cookie dough to make the most uniform cookies. Cool marble surface keeps dough at proper consistency and more manageable. It also makes rolling dough easier and quicker. 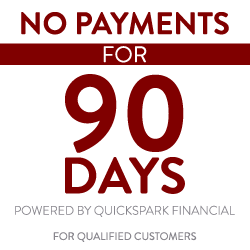 Marble will not absorb fat, moisture or odors. Refrigerate marble rolling pin approximately 30 minutes before using. Roll out pastry to desired thickness. Wipe clean after each use. Store on convenient stand. 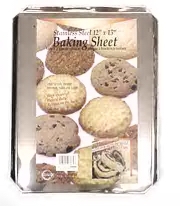 Great for cookies, pies, cakes or any baked goods that need to be cooled. 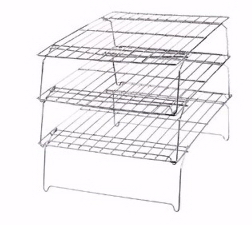 Four interlocking pieces allow for stacking or arranging into just the right configuration. Easy to clean, heavy duty!! 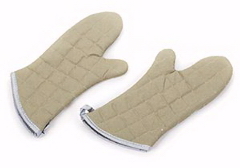 These tan oven mitts are 17" long. The exterior fabric is treated to resist and retard heat. Heat protection up to 400 degrees Fahrenheit. Water and stain repellent for added safety.